Trump's ego is screaming for a military parade amidst the numerous investigations involving him, and his bromance with Putin. 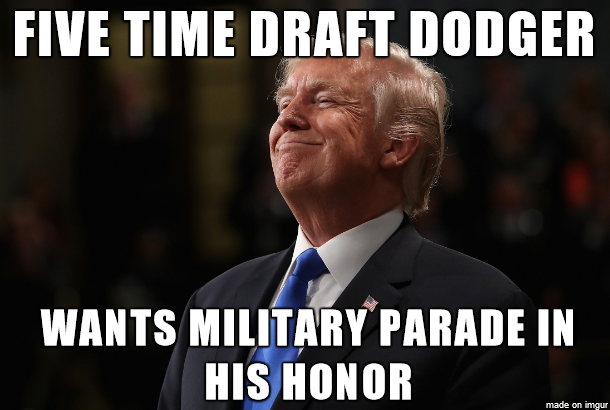 The cost for the American taxpayer to fund his parade, is not even considered in Trump's world. The fact that it'll cost as much (if not more) than the cancelled war games in South Korea is glaring. Why? Because Trump bragged that he saved the US some money (even though it was at the expense of our national security) by cancelling them. Trump told US officials that the games were "tremendously expensive" and they "Cost a fortune." Yet, he has no problem demanding a parade that will cost as much (if not more) to soothe his gigantic ego which has taken a beating lately. The Pentagon still doesn't know where it's going to get the money - it's not factored into their budget. That doesn't bother Trump who will find the money somewhere, by cutting something, or taking away services to Americans from the overall budget. The fact that our Liar-In-Chief still plans to have the parade he always dreamt about (it's a common dream among dictators), shows you how little he cares about you, and me. As the Mueller investigation progresses we're going to find out if there was any coordinated activities between Trump's campaign and Russia. Putin has come out publicly and said he wanted Trump to win, but denied helping him. That denials flies in the face of the facts our intelligence community has gathered. Indicting 12 Russians for attacking our election through cyberwarfare, is just the tip of the iceberg. Let's see what we find out about the recently captured spy from Russia, Maria Butina, who cozied up to Republicans, and the National Rifle Association. As Trump's supporters in Congress become more desperate, expect more attacks against our intelligence community and rule of law.